Pant-Hoot is a night of excellent stand-up comedy and chimpanzee information from Charles Star and Monkeywire. This is going to be a monthly Tuesday night show. Hosted by Charles Star with an educational interlude from Monkeywire.org. Based on DOB records, it appears that the new owner of 185 Ocean had his plan to build an eight story building on the lot rejected. As we don't speak building code, it's completely unclear to us why the plans were rejected. We're sure he'll build something... our best guess is that it's quite possible that he could submit refreshed plans for an eight story edifice and push them through. 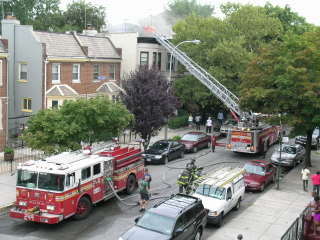 Apparently, a fire broke out at 97 Fenimore St. on August 19. From what we're told, there were no injuries. However, the homeowners are reportedly artists, and it is possible that much of their work was destroyed in the fire. Our best wishes go out to the owners of 97 Fenimore. We got a little emotional about our chronic troll's recent activities, and as several readers have pointed out both online and offline, we went a little overboard. We don't think there's much point to offering a defense, as we think anyone would understand the frustration. That said, we've taken down reference to said event (other than this post). It's rare that we see an apartment for sale on Ocean Ave. as most of the buildings on Ocean are rentals. 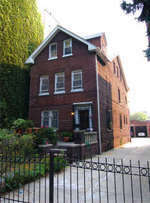 However, 125 Ocean Ave. is a full fledged coop, and apparently this two bedroom unit is for sale. It's for sale by owner, asking price is $475,000. For a two bedroom in Brooklyn, $475K is not a bad price. For a two bedroom on Prospect Park, $475K seems like a deal. We stopped by tonight's National Night Out on Maple St. tonight to see what was going on. Much to our surprise, A LOT was going on. Cutting through the intense humidity was dance, barbecue and a giant crowd enjoying themselves. There was also a band and a huge thing that kids were inside bouncing around. And, of course, Health First was there should anyone find themselves wanting to sign up for Medicaid. Mayer Bloomberg was also present. We missed his speech, but a neighbor told us that he emphasized the need to keep guns off of the streets to avoid future tragedies like the loss of officer Timoshenko.